The ftwilliam.com 5500 Forms software is fast and reliable. Combined with our world-class customer support and cloud based technology, the ftwilliam.com 5500 solution is the market leader. We are proud to say that 8 of the 10 largest TPAs in the U.S. use our software to file their 5500s. 55AutoFill Technology. 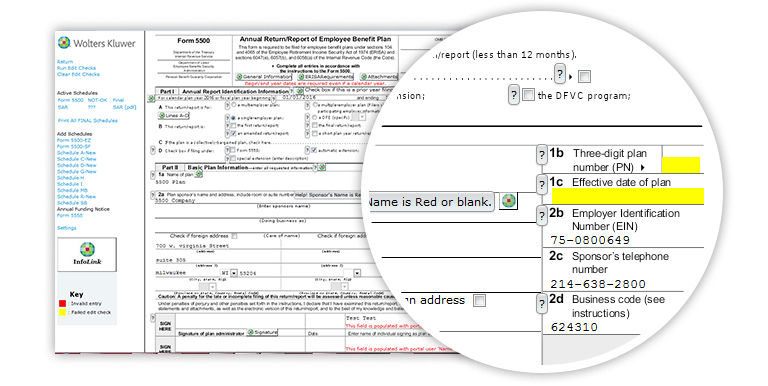 Last year’s filing is automatically pulled from the DOL database based on client’s EIN. Available in batch for quick and easy conversion! Integrated. Data from the previous year’s forms are automatically transferred to the current year. Streamlined Data Import and Export. The exclusive ftwLink feature provides an XML based interface for interfacing with your 5500 forms and schedules. Using ftwLink you can add and edit 5500 forms and schedules, extract 5500 data, and generate final 5500 schedules and forms using a single, easy to use XML interface. Batch Features. Batch print all of your Summary Annual Reports, Annual Funding Notices, Form 5559s, and 8955-SSAs. Also, Provide us a list of EIN numbers and we can batch download the prior year 5500 filings to our 5500 software. No additional charge. 5500 Workflow Grid. Assign plans to administrators, track status of e-signatures, and track whether plans have been submitted and accepted by the DOL. Single Sign-On – Our web portal integrates seamlessly with your website so that our web portal may be accessed directly from your website. Download Signer Names from Prior Year 5500 Filings – The download will include a list of plan name, sponsor name and address, EIN and plan number; as well as signer name and signer type (sponsor and/or administrator). Upload Signer/Portal User Information – You can batch upload signer information for the signers/portal users (name, user ID and portal permissions). Integration with PensionPro. Allows your 5500 data to flow seamlessly into PensionPro’s Workflow software, providing you with greater control, efficiencies, and compliance. InfoLink—Direct access to the Aspen Publisher’s 5500 Preparer’s Manual via InfoLink! We have exclusively integrated the very popular 5500 Preparer’s Manual, written by industry experts Linda T. Fisher and Mary B. Andersen, in electronic format, with the ftwilliam.com 5500 software for an additional fee. This integration, known as InfoLink, allows users to link directly to the online version of the Aspen Publishers 5500 Preparer’s Manual from the ftwilliam.com data entry screens, without having to log on to the CCH website or retrieve the book and look for the answer. By clicking on special icons in our Form 5500 software, the appropriate content from the 5500 Preparer’s Manual will automatically appear in your browser. Interested in finding out more? Our sales team is ready to answer any questions you may have or schedule a demonstration of our software. Use our interactive map to find your ftwilliam.com sales consultant.